This four –day package offers us a perfect getaway for a complete relaxation highlighted by unspoilt beaches, blue oceans and secluded islands. It can be easily combined with other premium tours available to color your holiday in Cambodia. In the morning, we get on private car for three and half hour transfer with accompanying guide for overland excursion to Sihanoukville. Upon arrival, we check in hotel and spend the remainder of the day on the turquoise water or lazing on a beach. Morning visit the International Port from the outside, Fishing Port and The Independence Square and Golden Lion. Afternoon visit Water Fall Kbal-Chhay. 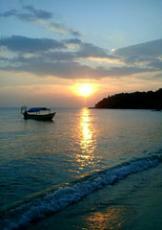 Overnight Sihanoukville. A free day for you to enjoy Sokha Beach or Victory Beach or explore some nearby islands. Overnight in Sihanouke ville. Free time to relax on a beach or explore the town until we board our vehicle for a trip back to Phnom Penh. We can see the pine forests at Kirirom National Park en route at your disposal. The trip ends after arrival in Phnom Penh.